Portrait of doctor in mask put on gloves and smiling. Middle aged physician wear gloves, ready to operation. Grey isolated background. 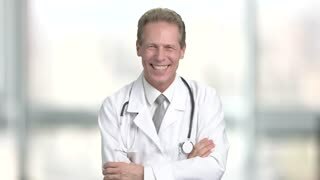 Confident mature doctor looking at syringe. Middle-aged male doctor in white coat holding syringe, blurred background. Serious male doctor. Portrait of serious male doctor with protective medical mask. Serious mature middle aged doctor puts on stethoscope. Green screen hromakey background for keying.